More sale news as Gary Cleaverly at Sunseeker London closes on the sale of the 24.69m motor yacht Whatever with Gokalp Ari in the Turkish office representing the buyer. Built by Sunseeker International in 2009 as a Predator 84 model, she boasts a host of extra features including a custom bar on the aft deck and a hydraulic bathing platform. Decorated throughout in black American walnut, she has a distinctive livery with a metallic silver superstructure and black hull. Accommodation is for eight guests in a master suite, VIP stateroom and two twin cabins plus four crew. 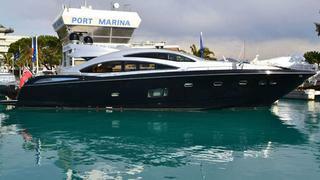 Twin 2,434hp MTU engines and a planing hull give her a cruising speed of 30 knots and a maximum speed of 37 knots.